Looking for a last-minute weekend deal? Our April weekday rate of 185/night has been extended through the upcoming Apr 26, 27, 28 weekend. Note from Bill & Carolyn: Check our Facebook page ‘Legacy Log Cabin in Muskoka’ for upcoming events. Check out our Instagram account #legacylogcabin for the latest pictures of the cabin and 90 acres of property. Legacy Log Cabin is a peaceful, get-away-from-the-hustle-of-the-city-kind-of-place. Enjoy 1200 square feet of private space for up to two people in a stunning log cabin, tucked in by a cliff face and surrounded by woods. Set back from a quiet, year-round and paved municipal road, it's located at the entrance of Legacy Maple Farm, a 90 acre, single-forest, producer of 100% pure maple syrup. comments and reviews often contain the words peaceful, quiet, and relaxing. Bill and Carolyn enjoy meeting guests at check-in and, whenever possible, saying good-bye at the end of the stay. They love sharing their little piece of paradise, and are committed to providing the perfect canvas for guests to create their own idea of a romantic get-away. When you first walk in, the massive hand-hewn round logs and cathedral ceiling create a dramatic, yet warm feeling, and the over-sized windows ensure an abundance of natural light, as well as great views. A spacious loft master bedroom features a statement-piece queen bed, triple-sheeted with luxurious high-end linens. You also have the choice of fluffy down or hypo-allergenic pillows and duvet/blankets. Under the loft, the large country kitchen, made of maple cabinetry, surrounding a centerpiece antique butcher block, is outfitted with all the appliances, tools, and basic pantry supplies necessary to satisfy both the 'throw together a meal' and 'gourmet foodie' types. The main floor bathroom has 'in-room control' heated slate flooring for use in cooler weather, and a generously-sized custom two person shower (with 2 shower heads). Outside, on the wrap-around deck, the barbecue area overlooks the maple syrup 'sugar house' and has a close-up view of the property's signature rock face. At the cabin there is a different flow to things. It is just far enough away from busy town life - a 15 minute drive, and more private than the cottage 'subdivisions' that line many of the lakes in the area. You can breath deeply here, enjoy a star-filled dark sky, listen to the hauntingly beautiful call of distant wolves late into the night, and watch deer from the front window. Note on Occupancy: The cabin is available for rental year-round, however we do cap the overall monthly occupancy rate to 50% (averaged over the year). Once we reach our target occupancy, the balance of the days may be blocked. We are currently working on our 2019 calendar and will be opening it up for bookings in the next month. Once settled in, you may wish to explore a little. If one of the owner's is on the property during your stay, you could ask for a private tour of the maple syrup 'sugar house' to learn about the making of this 'liquid gold'. If your stay is during 'sap' season (anywhere from February 15 to mid April, essentially whenever mother nature decides), you could see the maple sap run, the wood-fired evaporator in action, sample maple sap right out of the tree and of course, taste the freshest, and most delicious, maple syrup you have ever had. If you love outdoor pursuits, you may want to explore some of the private trails that weave through the 90 acres. Here you have the ability to begin adventures right outside your door, during all four seasons (hiking during the spring, summer & fall, snowshoeing or snowmobiling in winter. It’s also a great property for outdoor photography. Want to do your adventuring off property? The area is full of opportunities. In spring, summer, or fall, explore hundreds of kilometres of hiking trails, canoe or kayak on countless lakes and rivers, enjoy world class fishing, ride the mountain biking trails, go zip lining or rent a jet ski, to name a few. In winter, you may want to cross country or down hill ski, snowshoe, go on a snowmobile tour, try your hand at dog sledding, or really amp up the romance with an evening sleigh ride. Looking for something more leisurely to do? You might want to go on one of the area’s historic boat tours, check out the trendy shops in Huntsville and surrounding communities, go antique shopping, attend one of the many local festivals, explore amazing local artisan shops, check out the Heritage Centre (for a pioneer experience), indulge in the food culture, enjoy the very active local music scene or watch a live theatre production. You will not be disappointed. let us know what your interests are, and we can help you plan your perfect getaway! 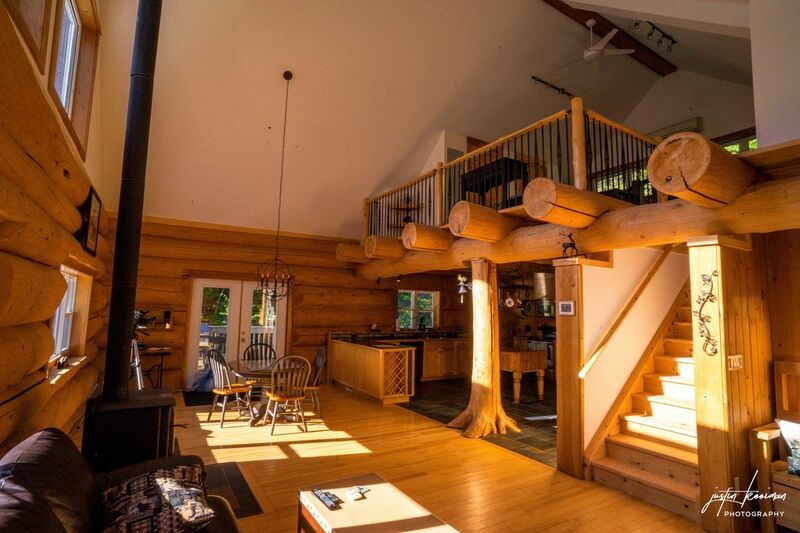 Why choose our Log Cabin over other vacation rentals? Whether it's springtime with all the maple syrup activities & wild deer visits, summer with its land and water pursuits (and wild raspberries to pick), the stunning colours of fall as leaves ready to drop, or a winter wonderland of fun, Legacy Log Cabin is ideally set-up as your home base. Note on Privacy: The cabin has two private suites. The main cabin, with it's loft bedroom, is self-contained and completely private with it's own driveway and entrance. The lower suite is used by Bill and Carolyn (it's walkout lower level entrance and driveway are located on the opposite side of the cabin). It is never rented out. The massive log walls and structurally substantial flooring support act as excellent sound buffers. Our guests often comment on how quiet and peaceful it is in the cabin. Bill's roots run deep in Ontario. His paternal great great grandfather pioneered an acreage about an hour and a half north of Toronto. As a child, Bill's family moved to a farm five miles from the cabin. Both of his sons were born and raised in Huntsville. And although he lived in western Canada for almost 20 years, Muskoka and Huntsville were still home. Bill had experience with the production of maple syrup while growing up. His family had 60 trees tapped on their 188 acre farm. He has also done logging, design and building of homes and renovations. Bill is a Master Electrician by trade, which comes in handy on a property like this. Carolyn spent many happy summer days as a child, escaping Toronto on family vacations for the rock and water of Muskoka. She too moved away to the west, which is where they met and married. She cut her teeth in design, marketing and sales in her 20s, using her arts background. Then moved into administration for large companies, until her independent streak could not be contained. She has run or managed small businesses ever since. What has tied all of their experience together is a love of travel and meeting new people. Both preferring alternative accommodations, they have experienced the best and the worst of the vacation rental industry. Their favourite VR's are the inspiration for the cabin and the property. Their goal, affordable luxury and great service. Bill and Carolyn Long had been planning to move to Vancouver Island to purchase some property and develop a business, while still pursuing their passions of hiking, skiing, and kayaking. That all changed in the fall of 2016 when, on a visit back to Bill's hometown of Huntsville, Ontario, they stumbled across a log cabin for sale, on 90 acres of maple forest with an existing, small maple syrup business. It was their habit to look at real estate whenever they visited a new place, and discuss what the possibilities might be. This trip was different, for many reasons. Before they even set foot in the cabin, they walked the property. It was late fall, so all the leaves were off the trees and you could see for quite a distance. They talked about how they could manage and conserve this forest. Something just clicked and they knew this was where they wanted to be. Programmable heated slate floor fully controlled by guests. This is a 'forest-front' property, with most of the land located behind the log cabin & above a long weeping cliff. Private trails meander throughout and are available for the use of cabin guests. There is an air conditioning unit in the loft, and it includes a remote for ease of use. All linens provided including sheets, duvet, blanket, pillows and pillow cases. We also use resort-style triple sheeting for optimum cleanliness. Available pillow choices: down and 'down alternative'. Kitchen tea towels. resort-style bath towels. We even provide a few rags with the clean-up supplies (just in case). The wood stove is one of the ways we heat the cabin. Guests must review it's operation with the owners prior to using the wood stove. Open concept with a very comfortable leather couch, and a storage coffee table with DVDs and games. Olive Oil, Balsamic Vinegar, Variety of Teas, Coffee Beans, Salt & Pepper, Approx. 20 Spices, Baking Ingredients, Aluminum Foil, Saran Wrap, Ziploc Bags, Coffee Filters, Chip Clips, Paper Towels, etc. Dishes and Utensils, Slow Cooker, Rice Maker, Magic Bullet, Cutting Boards, Assorted Specialty Knives including steak knives, Salad Tongs, Tea Towels, Oven Mitts + more. Kitchen is fully equipped. In the loft bedroom is a bluetooth speaker. The cabin 'library' includes a variety of books and magazines in various genres. The cabin is supplied with a variety of games - for days you just don't want to go out. There is a selection of DVD movies (from romantic, to adventure, to action). We have included some of our favourite mini-series as well. The fire pit area is behind the house, shielded by the rock face. We take care of the lawn & garden maintenance. These supplies are locked in the shed. Guests are not permitted in the shed. MLM Boat Rental - 105 Fitzgerald Dr, Utterson, ONT 705-789-8359 Boat rentals include Glastron and Tahoe Bowriders, Pontoon boats, Lund Fishing boats & more. Services include boat docking & gas. Wraparound deck on the main level is exclusively for guests. There are several 'free to use' tennis courts around Huntsville (first come first serve) Meadow Park - off of Scott Street on Meadow Park Drive Conroy Park (shared use) - off Brunel on Forbes Hill Dr. Included at the cabin, for your convenience, is a guest binder covering a multitude of options and opportunities in the area. Legacy Cabin is a FANTASTIC place to unwind and relax. Carolyn, Bill and Spark are extremely friendly and helpful. The cottage was very clean and well equipped. When we arrived we were pleasantly surprised to see the snowmobile trail directly across the road, making getting to the trails extremely easy. My wife and I are already planning on heading back again next year. Thanks again Carolyn and Bill for letting us share your little bit of paradise. My boyfriend and I plan on coming back to this cabin. Bill and Carolyn are amazing hosts and every detail is thought out well. Everything is so comfortable and a great nights sleep is guaranteed! The cabin is unbelievably beautiful and clean and the walking trails are a big plus. The whole place is very romantic. There’s also a great movie and game collection. Can’t think of anything they’re missing! Come find out what Peace and Quiet REALLY IS!! I had forgotten what peace and quiet was until my wife and I came up for our getaway. I don't even think my dreams are that quiet when I'm asleep. Legacy Cabin is an immaculately kept, picturesque spa getaway for the soul. From the heated floor in the bathroom, to the double headed couples shower this cabin really wants you to indulge in doing nothing. The property's snow covered marked trails gave the little boy scout in me something to conquer. Due to the vast property size, you are even fortunate enough to be able to enjoy forest to table maple syrup. Our winter getaway experience here at Legacy Cabin, surpassed our cityslicker expectations. Especially since I was able to use my android box to sit on my rump and just veg and stream tv and movies to my hearts content...LOL In all seriousness though, it truly was so serene that it took me a day to figure to what to do with myself. We will definitely return to enjoy this "Spa for the Soul". This cottage is beyond imagination in all its aspects and as non-native speakers we lack the proper words to describe all its sweet, nice, useful and overwhelming parts and details! Combined with Carolyn's and Bill's compassion in preparing it for our stay our Christmas 2018 will remain an ever-lasting memory for us - thank you very much. Like living in a snow globe! We had a wonderful stay at Bill & Carolyn's cottage just before Christmas. The cottage is beautiful and has everything you could ever need. We were instantly relaxed and looking out the windows at the beautiful winter scene around us was like living in a snow globe. We look forward finding time to go back. It is so peaceful and relaxing. Along with winery tours, Muskoka several craft breweries which offer tours... and it's own craft Roastery. Take a float plane our for a bird's eye view of the area. In winter, there is ice climbing or dog sledding tours. PLEASE NOTE: If you are using VRBO.com or homeaway.com, currency rates will default to U.S. dollars. The “Instant Quote” or “Detailed Price” features, are also quoted in U.S. dollars. To see the quote in Canadian dollars, click on the ‘Rates’ tab and, on the right hand side, change the “Rental Rates quoted in” to CAD currency. If you are on the homeaway.ca site, the listed rate and quotes default to Canadian dollars.